The Red Roses amassed eight tries at Energia Park, Donnybrook, a ground that is fast becoming an all-timefavourite of theirs, after the Grand Slam win there in 2017. This was a significant day in the world of women’s rugby, the first time a full-term professional side had taken the field. For most of the 80 minutes, they fulfilled all the expectations of their supporters. But you wonder what the final total might have been, had they remained blue-blooded amateurs for another month. Possibly 7-50? Not these days. With Sarah Bern and Hannah Botterman giving life-like imitations of centres, England were given huge go-forward from the start. Needless to say the hosts played with great commitment, Michelle Claffey making a dangerous incursion early on. But the defence held strong. Despite enjoying plenty of possession, England managed only one more try before the break. Ireland showed plenty of thrust, but the odd error stymied their chance of a score. KD-M indulged herself with yet another grubber through. This time it was McKenna on the receiving end. This has been a rich source of success in recent campaigns. Though there was doubt in Irish minds about the touchdown, Aimee Barrett-Theron was happy to accept her AR’s verdict. Photographers who had gathered there escaped with their lives. Before half-time, the injured Marlie Packer was replaced by Amy Cokayne, who showed that she could probably occupy any position on the field. This wasn’t a safe lead, but many pundits feared for Irish hopes after the restart. England were always likely to outlast their opponents, and the newer faces on the field would settle down ever more comfortably alongside their more experienced team-mates. And so it proved: the Red Roses ran in no fewer than six further tries. Bern and Botterman continued their un-front-row-like runs to offer the outside backs yet more room for manoeuvre. Leanne Riley increased the pace dramatically and the front five all showed their handling skills. Tatyana Heard made a strong impression at inside-centre, helped no doubt by the reassuring presence of Emily Scarratt beside her. Now the planned replacements began to appear, starting as usual with the front row: On came Shaunagh Brown with Bryony Cleall (her long-awaited first cap). I’ll comment on this move below. On 62 minutes Ireland had the well-earned consolation of a penalty try as England lost their concentration at a scrum. 7-34 (the final score last time the two sides met here). 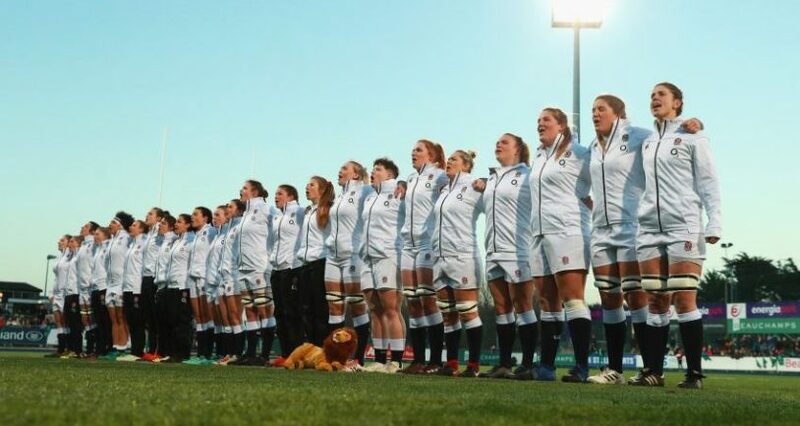 It’s an indication of the Red Roses’ all-round strength – and individuals’ desire to put a marker down – that the last three tries all came from replacements: Zoe Harrison 7-39. Emily Scott 7-44 and Bryony Cleall 7-51. Ireland put up a huge fight all through. Claffey made an excellent impression in the centre,. Leah Lyons grew in menace when moved to tight-head, helping to create the penalty try, and Claire Molloy was as outstanding as ever. She won the turnover stakes yet again.. Anna Caplice gave a strong showing off the bench, but the loudest cheer came for Alison Miller, returning after an arduous rehabilitation from a horrendous leg injury last year. Typical of her, one of the biggest hits of the evening was performed on Cokayne. This was courage of the highest order. Middleton’s dilemma now is that the next fixture is the hardest. He may decide to give all today’s non-starters a run in Doncaster, but his first task is to ensure the Big W. So while players like Rachael Burford, Vickii Cornborough and Abbie Scott can be sure of a start, that may not apply to everyone else. Who’d be a selector? A show of hands, please. The appearance of Brown S. and Cleall B. in the front row marks the most fascinating and debatable policy-decision the management have made. Of course both are essentially back-rowers, and very good ones. But Simon Middleton and his staff made an interesting call in the autumn, requesting that both be moved up to wear the 1 and 3 shirts in their clubs’ packs. Both have played the odd Tyrrells game since in the back row, but now their challenge was to repeat the heroics of the two youngsters they were replacing. It’s hard at this early stage to spot relative shortcomings in the overall strength of the 35 contracted players, and there is no lack of resource in either set of positions. Not on show today up front were Vickii Cornborough, Justine Lucas. This and the youngster Ellena Perry. And Vicky Fleetwood happens to be a World Cup winner there too, but her future seems to lie further back, where she will compete for a place in the 2021 version with such as Packer, one or two Clealls, Burnfield, two Browns, Beckett (her second cap today), plus the returning Alex Matthews and Harriet Millar-Mills, we hope. That excludes the constant possibility of new starlets appearing as rapidly as Breach and Kildunne did last year. We know that the management want mobile props, and they’ve got them aplenty. But they mustn’t come at the expense of scrummaging skills. The oldest rugby maxim is: ‘It all starts in the front row’. All the younger/newer props being trialled need to prove their technical ability in the set-scrum before they can show off their talents in the open field. The video analysts may have a story to tell about that penalty try England conceded.